What Knowledge and Skills are Needed for Solving Sustainability Challenges? As individuals, sometimes tackling sustainability challenges seems daunting. The Sustainability, Science & Society (SSS) program recognizes individuals must come together to solve our grand challenges. The program aims to (i) provide students with knowledge across a range of disciplines to help facilitate interdisciplinary communication, (ii) allow for disciplinary depth with which s/he can add value, and (iii) instill leadership and soft skills that are key to effective problem-solving. 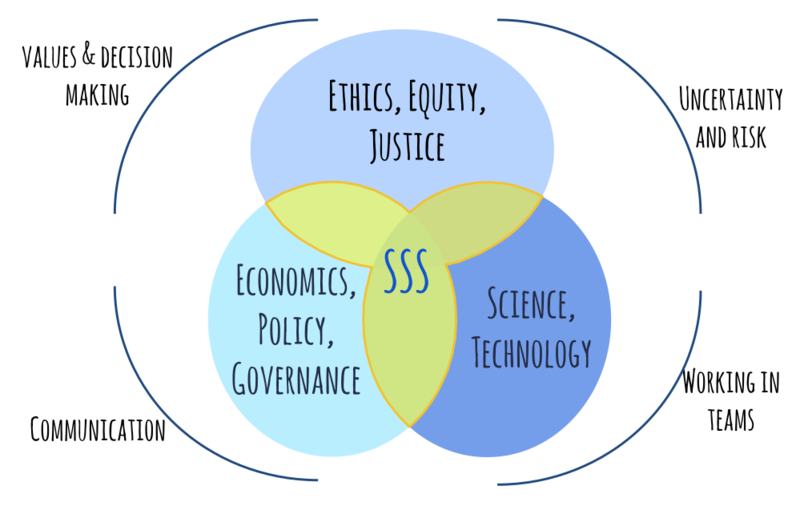 The SSS degree brings these components together in a coherent, structured program. The structure of the SSS program ensures the first point is covered through coursework in three thematic pillars. In-depth disciplinary skills are obtained through one's minor requirements and/or electives. Finally, the SSS program uniquely aims to cultivate the leadership skills necessary for solving sustainability challenges through what we call core competencies. III. Ethics, Equity, and Justice: to discuss why we need change, and the issues of equity and justice associated with taking action. The courses in the SSS program are designed to expose students to these thematic pillars. The SSS program is an "Interfaculty" program between the Arts and Sciences, offered in close partnership between Geography and the McGill School of Environment and other departments at McGill. Program course requirements fall into one of the three "pillar" categories listed above (see the official McGill calendar or the SSS program planning; sss_programplanning.xlsx for more detailed course information). Substantive efforts all require cooperation within a team, and teams are necessary to tackle the complex problems that we face. One key challenge to sustainability is communicating complex topics and core scientific concepts in ways that are easily understood by society. Predictions of the future are wrought with uncertainty. It is necessary we better understand its role in decision-making. Values are produced in multiple ways. Sustainable solutions requires understanding stakeholders' wants and desires, finding ways to prevent or mitigate value conflicts, and still making progress toward viable solutions. Gain a critical understanding of the concept of sustainability, its contested meanings, multiple dimensions, perspectives and scales. Gain an in-depth understanding of a specific set of sustainability challenges, including the interconnection between the three pillars of SSS, scales of those challenges, and relationship to personal choices. Acquire hands-on experience with a suite of analytical tools used to address sustainability challenges. Will learn to shine a light, instead of cursing the darkness, and offer feasible alternatives to the status-quo. Appreciate the role of science in society and also that societal decision making involves multiple perspectives and factors that go beyond science. Be able to persuasively communicate ideas, orally and in writing, to multiple audiences.